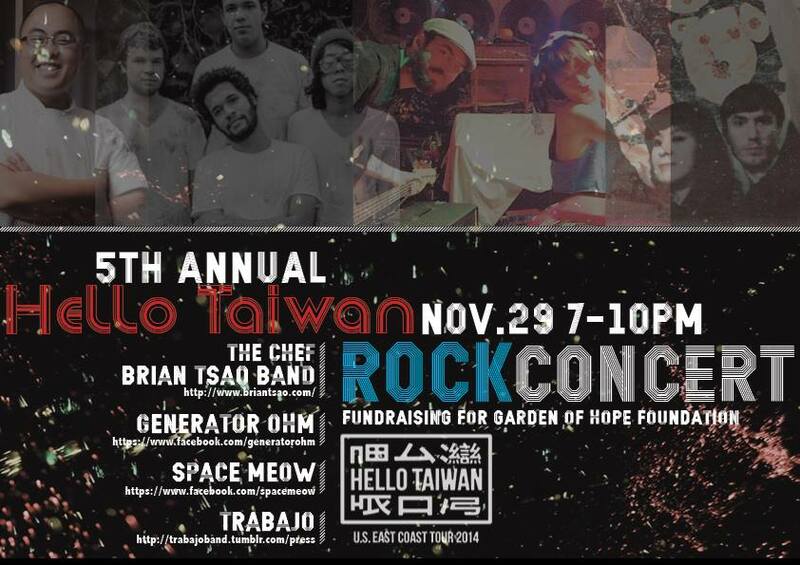 Come out to the 5th Annual Hello Taiwan Rock Concert, featuring Space Meow, Trabajo, the Chef Brian Tsao Band and Generator Ohm! In the last few years, many local Taiwanese communities held the annual Hello Taiwan! concert and raised over $20,000 to support different non-profit organizations. This year, the organizers are donating and fundraising for Garden of Hope Foundation. Generator Ohm is a quartet for rock and roll. Big on guitars. Friend of the low end. And we never miss a beat. Got them all. Ernest D’amaso, and Willie Chen created Generator Ohm in 2010. We play with dirt and find creatures of life between our fingers. We jump the tires and see with closed eyes what is on top of that summit beside us. We forget to bring our cameras, and settle for focusing on the things we want to remember. We take the day on our backs, and unpack the burdens at night to seek the fruits of a bard’s labor. We do it the way we heard our heroes do it; with guitars, drums, and our voices. We have a new set of sounds to express, and a new set of tools to use, produced by electricity from within the human heart. Generator Ohm is first heart, then comes resistance. Space Meow is an international art and music group created by experimental filmmaker Dooll Chao, with photographer Walter Wlodarczyk and actor / producer Adeline Thery. The band combines electronic loops, live instruments and visuals in a fusion of Asian, European and American styles to create songs that have been described as dark, yet danceable. Their work is inspired by punk rock, hip-hop, New York City, the relationship between Eastern and Western cultures, space, and cats. Mira Sushi & Izakaya’s executive chef and the only challenger to win on Food Network’s “Beat Bobby Flay” season one, Chef Brian Tsao grew up with dreams of becoming a musician. Though musical ambitions were put aside for nearly 10 years as he pursued his other passion, the culinary arts, music had always been a part of Chef Brian Tsao’s life. The music brought to life by the Chef Brian Tsao Band is like his cooking… furious, hard rocking and loud! With influences from 80’s hair metal, classic rock & stoner rock, Chef Brian Tsao, together with drummer Joe Robinson and bassist Eric Chong, are going to FRY your senses… literally.